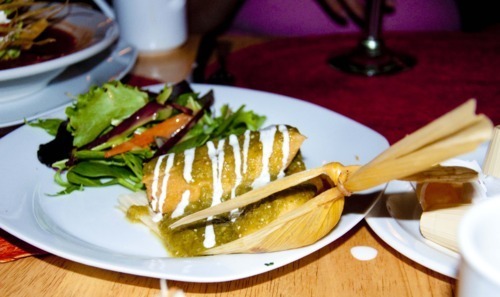 Located on Hunter St in the “cafe district”, as it has been recently referred to, La Hacienda is Peterborough’s authentic representation of Mexican food. Though there is a crop of burrito joints cropping up in Peterborough La Hacienda sticks to classic Mexican food - not the Tex-Mex variety. The spaced-out tables and decor reminds me of Mexico - don’t worry there are no sombreros hanging on the wall. 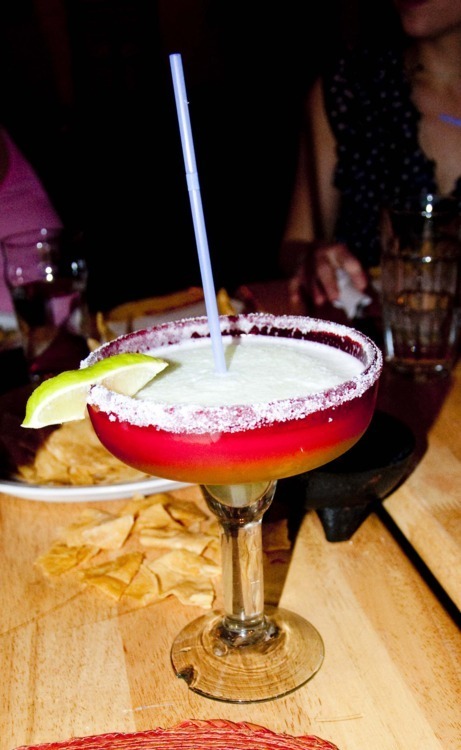 Of course the drink of choice is a classic margarita. They also carry Mexican beer like Negra Modelo; try it if you’re a fan of dark beer. 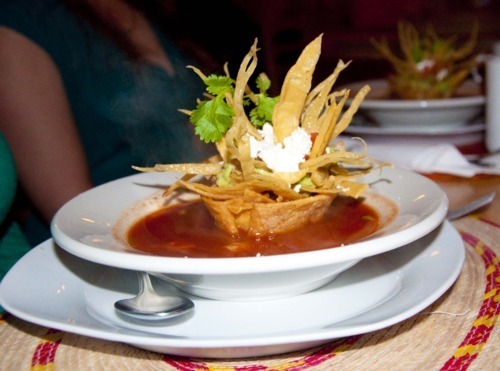 Shannon ordered the Sopa Azteca (Aztec Soup) which is her favourite dish at La Hacienda. Not bad looking either. 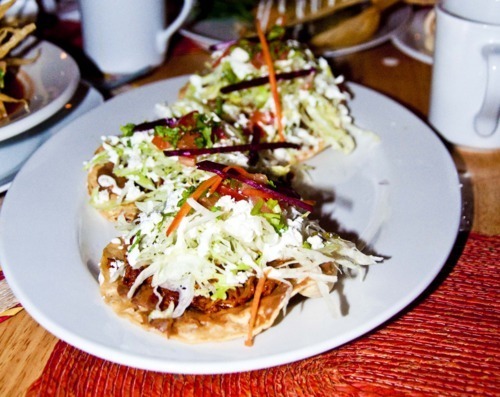 On top of it we ordered the Sopes Tinga - there’s some richly marinaded chicken under that garnish. The Tinga chicken is available in a number of different dishes - think pulled-pork but with chicken - pretty excellent. The Quesadillas Tinga reminds me of my trip to central Mexico; quesadillas made with little fresh corn tortillas (super popular in Mexico) and Mexican cheese - not exactly what most people think of when they order quesadillas. I’m not too sure what this is - something with a banana leaf - whatever it is it looks pretty neat. I ordered the Enchiladas de Mole - mostly because you can’t really find mole anywhere else. They take that awesome Tinga Chicken, wrap it in a corn tortilla and smother it with mole sauce. 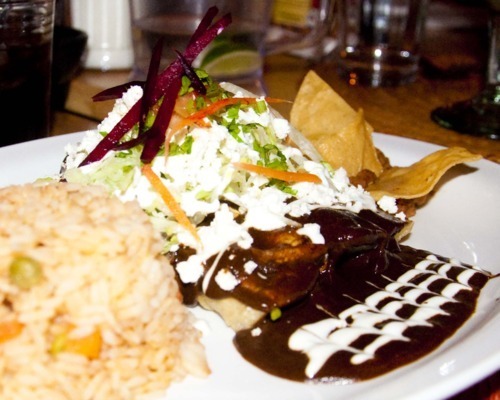 Mole (pronounced Mole-Eh) simply means sauce in Spanish (as in guacamole) and when used alone refers to a savory dark chocolate sauce served over meat. The chocolate taste is not sweet so despite what you may think it actually goes really well with chicken. Check out La Hacienda if you’re looking for wonderful marriage of Mexican flavours and are willing to spend a little extra over Tex-Mex.